HANGZHOU, China, June 5, 2018 /PRNewswire/ — Hikvision, the world’s leading provider of innovative video surveillance products and solutions, today announces a new range of EasyIP 4.0 cameras and NVRs. Building on the capabilities of our EasyIP 3.0 range, these provide simple, practical and affordable surveillance solutions for small and medium size businesses. The EasyIP 4.0 products are built on Hikvision’s H.265+ Smart Codec, which reduces bandwidth and storage requirements by up to 50% over H.265, delivering major IT savings for small and medium size businesses. Integration of Hikvision AcuSense into EasyIP 4.0 IP cameras and NVRs helps filtering out false alarms with more than 90% accuracy and has faster reaction to real security threats. Hikvision AcuSense works by detecting humans or vehicles and effectively filters out false alarms triggered by natural movements, such as rain or leaves. With automated strobe lights and audio alarms, Hikvision AcuSense-enabled cameras also deter would-be intruders before a security breach occurs. Additionally, the Hikvision AcuSense cameras further incorporate Hikvision “Powered by DarkFighter” ultra-low-light illumination technology, which provides superior surveillance images, even at night. Combined with ultra-high-definition video capabilities, Powered by DarkFighter ensures that organizations can identify and react to security threats effectively, as well as provides great video evidence in the event of a security breach. As an extension to Hikvision AcuSense, EasyIP 4.0 NVRs offer a “quick target search” feature that allows security teams to find footage quickly in the event of a security incident. This saves many hours for teams who would otherwise search for footage manually. EasyIP 4.0 ColorVu cameras use warm, supplemental lighting to deliver bright color video images, even at night. Round-the-clock color-boosting capabilities are powered by an F1.0 super aperture, a more advanced sensor, warm supplemental lighting, and a range of other technologies. With brighter, more colorful video, EasyIP 4.0 ColorVu cameras support protection against security breaches whenever they happen, day or night. The new EasyIP 4.0 ColorVu cameras can be paired with one of Hikvision’s AcuSense-enabled NVRs to minimize false alarms, and speed up target searches. EasyIP 4.0 cameras and NVRs provide high-grade, cost-effective surveillance solutions for small and medium size businesses. To learn more about Hikvision’s EasyIP 4.0 security solution, visit their booth at IFSEC International, #D300. The new Hikvision EasyIP 4.0 product line will be available through authorised Hikvision distribution channels in Q3 2018. Hikvision is the world’s leading provider of innovative video surveillance products and solutions. The company advances core technologies of audio and video encoding, video image processing, and related data storage, as well as forward-looking technologies such as cloud computing, big data, and deep learning. 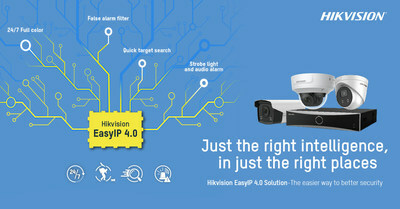 Visit us at www.hikvision.com .